ANTS is always trying to give the parents a chance to recognize where their child stands when it comes to progressing. Here we have broken down the most simple and major tennis terms. During each class you will get a chance to see where you child stands and the beginning of the class and at the end of class. These definitions are meant to help you understand the meaning behind the mark your child has received. As you can see below, the list is quite extensive. 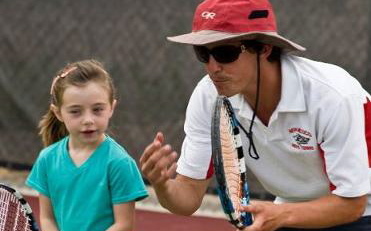 Our coaches are here to cover each layer tennis has, which is a deep game. These are the required fundamentals a child needs to learn to be able to progress. Agility: the power of moving quickly and easily; nimbleness: exercises demanding agility. the ability to think and draw conclusions quickly; intellectual acuity. Balance: an even distribution of weight enabling someone or something to remain upright and steady. Coordination: the organization of the different elements of a complex body or activity so as to enable them to work together effectively. Grip: In tennis, a grip is a way of holding the racquet in order to hit shots during a match. The three most commonly used conventional grips are: the Continental, the Eastern and the Western. Most players change grips during a match depending on what shot they are hitting. Tracking: Ability to use eyes to track the ball, its speed, spin, height, bounce, and flight. Footwork: Ability to utilize feet to get to the ball, stop, hit, and recover repeatedly. Receive: Ability to track the ball coming to them, and utilize footwork to get in position to send the ball back over. Also means ability to read the ball and all of its contents. Tennis Etiquette: the customary code of polite behavior in society or among members of a particular profession or group.